Printed reproductions are available as 18″ x 24″ posters or note cards in my Etsy shop. 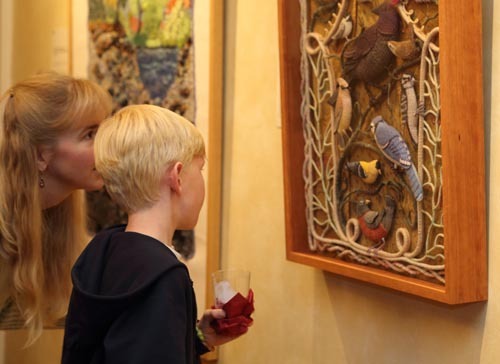 About the artwork: Birds of Beebe Woods was made for a fiber art exhibit celebrating the town forest in my home town of Falmouth, Massachusetts in 2012. In my piece, I wanted to feature wildlife as well as convey the natural environment of the woods. I chose to portray birds, making them realistic enough to be recognized, but patterned and abstracted in a way that made them fun to stitch. 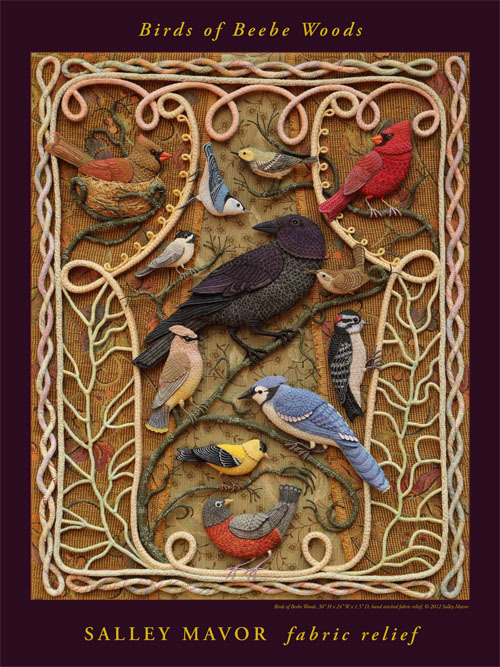 When planning the birds piece, I started with a simple sketch and then got to work on the woodsy border, with its felt-covered wire filigree stage curtains. The crow came next and then the other birds common to our area of New England, making a dozen total. Listed clock-wise, they are female cardinal, nuthatch, black-throated green warbler, male cardinal, wren, downy woodpecker, blue-jay, robin, goldfinch, cedar waxwing, American crow and chickadee. Since many people have asked if the original is for sale– no, as I will be holding onto it, so that it can be displayed in public exhibitions. 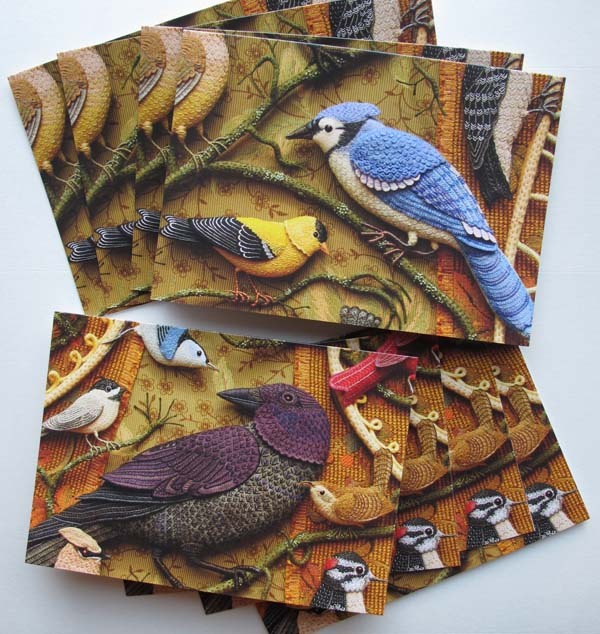 Detail images from Birds of Beebe Woods are printed as note cards, too. They’re available in my Etsy shop. Before I sewed everything onto the background, my husband, Rob took a photo of the felt covered wire border suspended in front of the woods around our house. 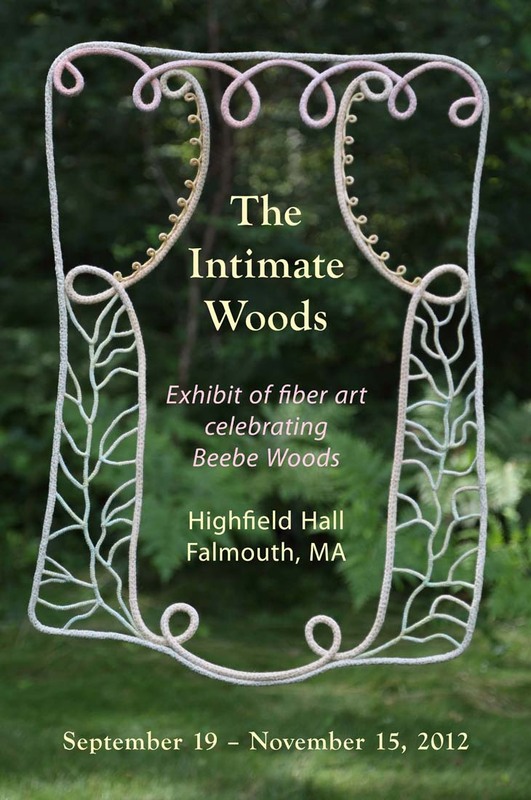 Then my sister, Anne used her graphic design skills to disappear the fishing line and make an announcement for the 2012 Intimate Woods exhibit at Highfield Hall in Falmouth. Archives: To see posts about the making of the birds in the piece, go to these links: crow here, goldfinch, nuthatch and chickadee here, blue jay here, cedar waxwing here, cardinals here, robin here, wren here. Wow. Gorgeous. I’m so impressed. I love how you made the poster for your art show with the help of your husband and sister. Congratulations! This is really incredible. I never saw something like this before and I love these birds. Breathtakingly Beautiful! I Love Love Love your work! I just adore your work. It is truly inspirational! You are so talented! I can’t wait to check out some of your work at a show one day. Absolutely beautiful. Your birds are simply wonderful–each one is a treasure! Can’t wait to save up for a poster. Ten years ago I bought a blossom fairy kit from you (such fun to make) and recently purchased some of your little board books–and then Pocket Full of Posies. I was at recess today showing it to our Kindergarten teacher and a little girl became silently captivated by each page we looked at. It was great fun! You delight and preserve the child in each of us. Where will your piece be shown in the future? It is so amazing, I’d love to see it in person. Thanks, I will announce any showings on this blog and facebook. Would love to have cards printed with a photo of this. Parabéns pelo trabalho maravilhoso, sou sua fã do Brasil. Parabéns ,seu trabalho e perfeito ,fico encantada , bjus. Brasil. I found a pin of one or your birds on Pinterest and discovered you site. All I can say is oh my goodness, I am in awe! You have a new instant fan! The poster is gorgeous!! I love the White-breasted nuthatch – we have those little beauties where I live in the mountains – beautiful!! You are an amazing artist and I am beyond loving your work, I totally adore it. Congratulations! Your works are beautiful and fascinating. sally, your work gets better all the time. am so glad you are doing this. i remember adam and eve made of salt dough…..
Wow! I love your artwork. My daughter bought one of your books for me as a gift. I am going to try and learn how to do this. Absolutely beautiful! I saw the exhibit at the New England Quilt Museum in Lowell. I could have stayed all day admiring the intricacy of your work. Thanks! just fabulous! Thanks for your creations! I am just about to start my first piece of embroidery on wool felt at the age of 77 !!! 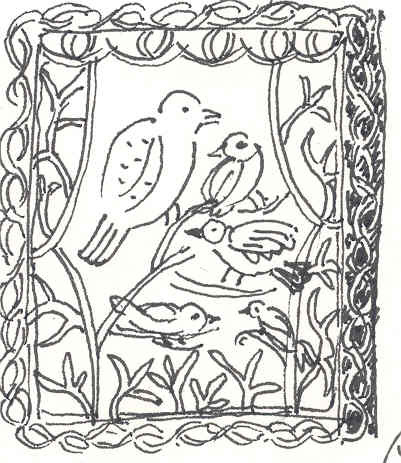 What a wonderful inspiration your birds are; all that magnificent , creative stitchery. I want to produce something related to the native acacia blossoms of my Australian bushland so seeing what is possible has given me enormous pleasure ( and encouragement). Many thanks. I see your postings daily on facebook and they always bring me a moment of joy. I look forward to seeing more. Absolutely beautiful! I would never sell it either! This is beautiful! I can’t imagine the hours involved in creating this. You are very talented. Thanks for sharing. Salley, your interpretations of our wonderful Australian birds would be fabulous indeed! I got to see the piece at the Woods Hole Art Exhibit this summer. It is so amazingly beautiful!! I bought a package of your cards, but have shared them away to others now. Breathtaking 🙂 your art is incredible…. What a wonderful surprise to the senses. I was strolling through Pinterest looking at needlepoint when I saw you tiny creations. They are delightful. And loved your video it expressed so perfectly those of us that “drank the kool-aid”. I did not fortunately having the survival skills to decern a con-man but many friends and family fell hard for the easy-fix. Again thank you so much for your talent and good heart.